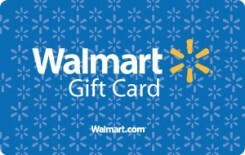 Use of this card constitutes acceptance of the Gift Card Terms and Conditions posted on Walmart.com. The card can be used in-store and for online purchases at Walmart.com. It can also be used by members of Sam's Club for in-store and online purchases at Samsclub.com. This card cannot be redeemed for cash. Prodege, LLC, doing business as Swagbucks, is/are not affiliated with Walmart Stores, Inc. The services, products or activities of Prodege, LLC, are neither endorsed nor sponsored by Walmart Stores, Inc.